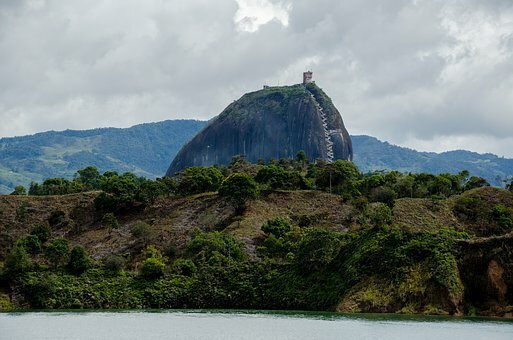 El Peñón de Guatapé, the Rock of Guatapé, is the weirdest thing – as you can see from the photograph. (See the video below too). This isn’t man-made, it’s a natural object. And there it sits, all alone, just waiting for you to visit it. Not a mountaineer? That’s no problem. You can climb the rock using its staircase. You’ll probably get short of breath because there are hundreds of steps but the view from the top will be well worth the effort. And you’ll find the facilities you need up there too. Thew rock is geared up towards visitors – you can buy food and drink up there. And also take some pretty magnificent photographs. The area was dammed in the 1970s and now the view from the top of the rock features rivers, lakes and islands. Where is El Peñón de Guatapé?